I am teaching my first class at BeadandButton in June 2012. The project is from our new book Show Your Colors, launching in February 2012. Description: Mix it up with this unique bracelet design using colored beading wire and craft wire. Students will create shapes with craft wire using a Wig Jig and learn tips for work-hardened wire. 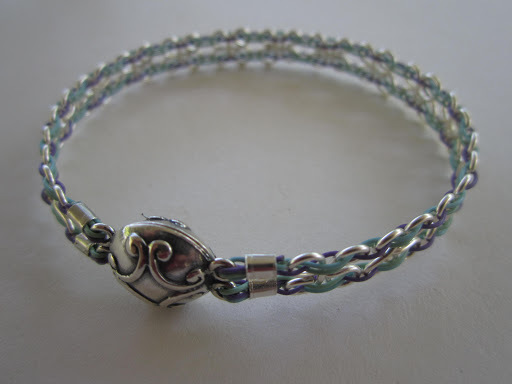 Then weave the colored beading wire through the craft wire shapes to make this one-of-a-kind design. To finish off the bracelet, you’ll learn everything you need to know about crimping. Materials in Kit: Soft Flex beading wire in three colors, Soft Flex 20-gauge silver craft wire, 3 x 3 mm crimp tubes, two-strand clasp. A portion of this kit is underwritten by Soft Flex Company.